One of my favorite meals to make for company and Friday night meals is Apricot Glazed Cornish Game Hens. It always impresses! The Cornish Game Hens can be made in the oven or on the barbecue grill. 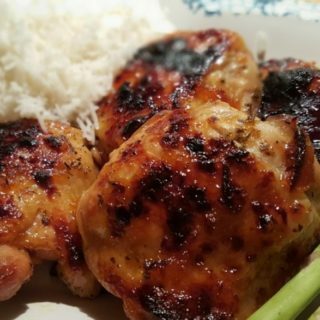 The recipe was written by Sunset Books, for the barbecue grill and years ago, I adapted it for the oven and now I have adapted for the Pressure Cooker, but I used chicken thighs. The chicken still needs to crisp up in the oven, so don’t forget to allow for the oven time. 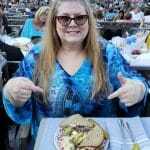 It was the first meal that I cooked for a special date, years ago. 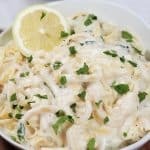 I still cook this on the grill, but on raining or hot days, I use my Pressure Cooker. 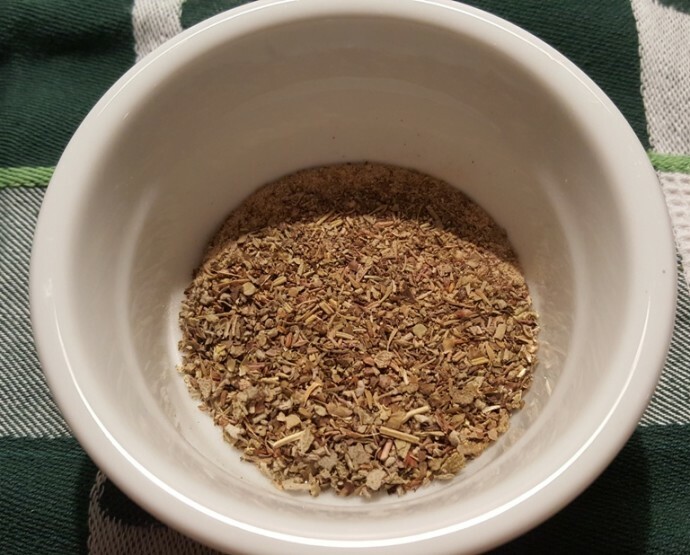 I use just a couple of individual spices, but wanted to make things easier for you guys in case you did not have the spices on hand. Herbes de Provence is a suitable replacement. 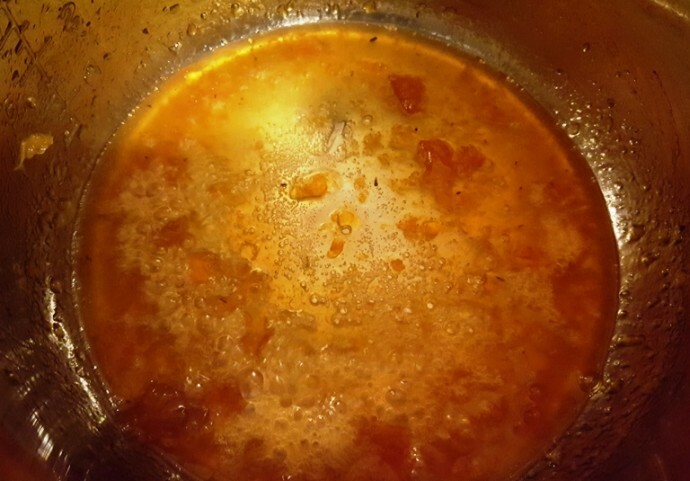 Mix together the spices and season the chicken pieces and place inside the Pressure Cooker cooking pot. Top your chicken with the butter and add some water. Since the chicken will need to crisp up in the oven, it is a good idea to heat up your oven now. Of course, you don’t have to finish it in the oven. If you are using boneless/skinless chicken, the oven is not necessary. Remove the chicken thighs to a cast iron skillet or oven safe pan and dump out the liquid from the Pressure Cooker cooking pot. For the glaze, you will just heat it in your Pressure Cooker cooking pot. 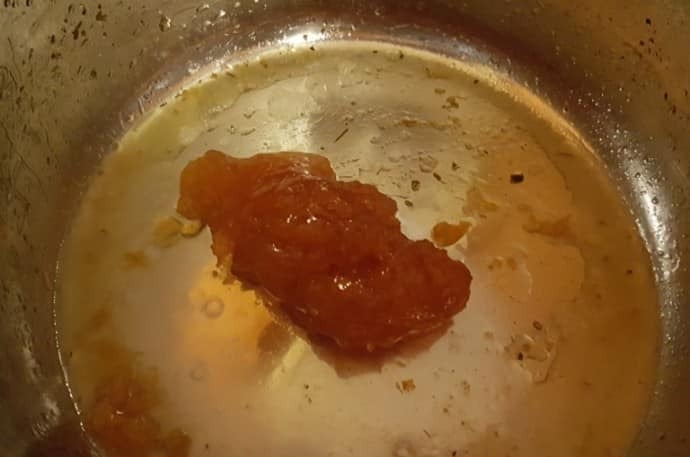 If you don’t have or want to use an orange flavored liquor, like Grand Marnier or Triple-Sec, keep a little liquid in the cooking pot, rather than dumping it out. 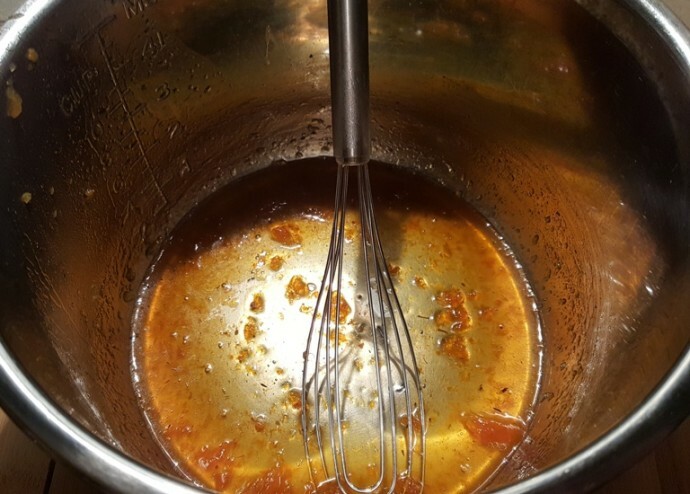 Whisk the glaze ingredients around while simmering until it turns to mostly liquid, breaking up the chunks of apricots. Remove the cooking pot from the Pressure Cookerand place it on a hot pad or trivet. Place the chicken, skin side down on a lightly greased cast iron skillet or other oven safe skillet. I love cast iron, as I can get a nice sear, at the same time of adding another layer of seasoning. 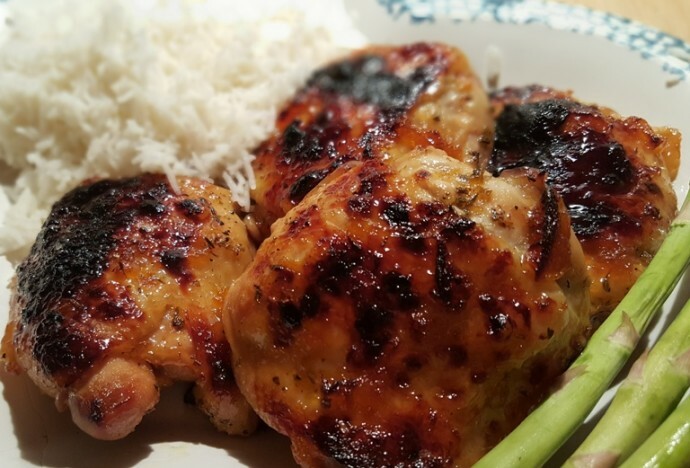 Using a barbecue brush, coat the chicken with the Apricot Glaze and place under broiler for about five minutes on each side, or until the glaze starts to caramelize. 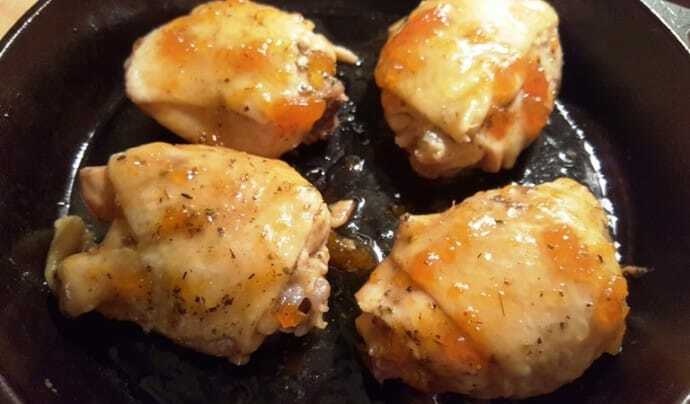 Flip over the chicken and brush on a thick coating of the Apricot Glaze and place back under the broiler. Once desired color is reached, remove the chicken from the oven and serve with Thai Triple Coconut Rice. This chicken brings back so many memories every time I make it. It pairs very nicely with my Pressure Cooker Thai Triple Coconut Rice or Mashed Potatoes with Glistening Sauce and a green vegetable. 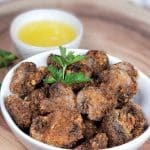 More Chicken Recipes You Will Love. Here is the handy printable recipe. Mix together Rosemary, Tarragon and White pepper and season chicken thighs. Place seasoned chicken thighs, skin side up, in Pressure Cooker cooking pot. 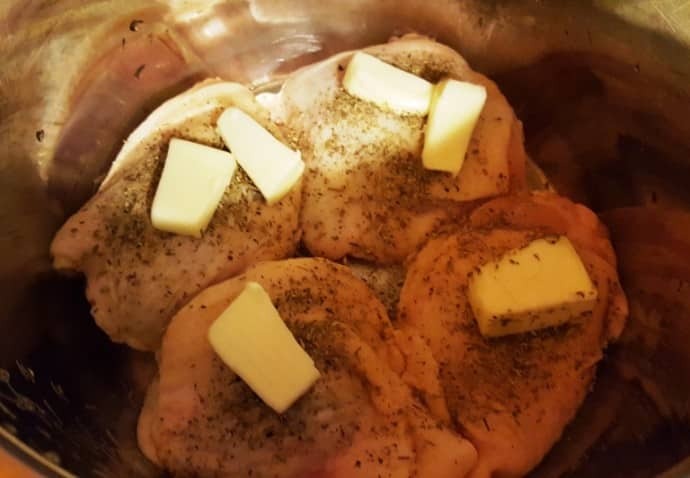 Place pieces of butter on top of chicken and squeeze Lemon Juice over chicken. Pour in water. Cook on High Heat for 9 minutes. When Beep sounds, allow a 15 minutes Natural Pressure Release. 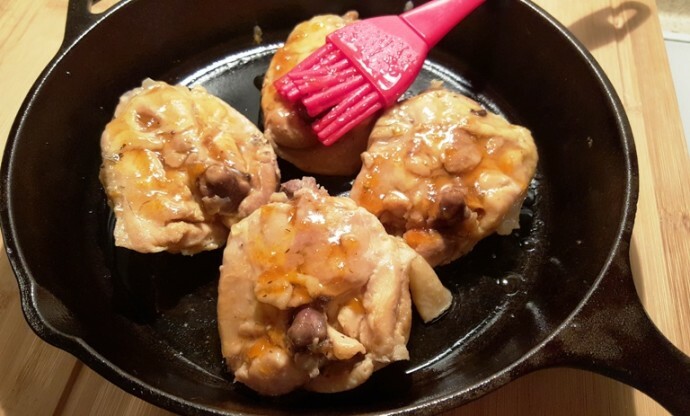 Remove chicken thighs to greased cast iron skillet or oven safe pan, skin side down. Dump out the liquid from the Pressure Cooker cooking pot. Turn on your oven's broiler to low. 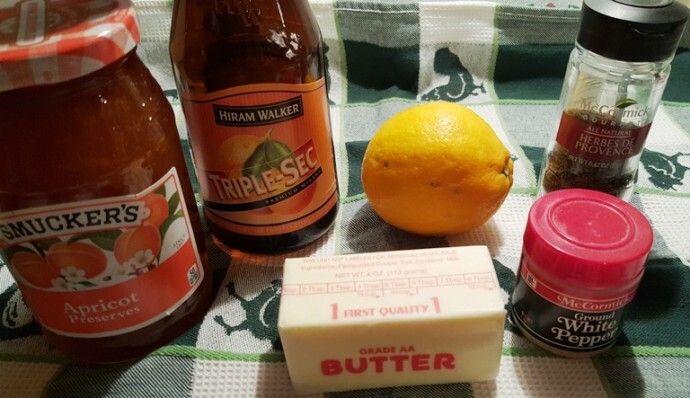 Select Sauté or Browning on your Pressure Cooker and add Apricot Jam, *Orange Liqueur and 1 teaspoon of butter. Whisk the Jam until it becomes liquid, about two minutes. Brush Apricot Glaze onto chicken and place under broiler for five minutes, or until Glaze is bubbling. Remove from oven, flip chicken and brush Glaze onto chicken skin and place back under broiler for five minutes, or until skin starts to char. Remove from oven, brush with the remainder of the Glaze and server with Coconut Rice. 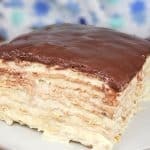 * If you are not using Orange Liqueur, reserve a Tablespoon of the chicken cooking juice. PIN this Pressure Cooker Apricot Glazed Herbed Chicken Thighs! 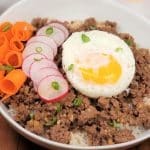 HI Jill, I am new to using my instant pot and would like to make this recipe. I have frozen cut up chicken parts… bone-in, skin-on: 1 large breast, and some thighs and legs. 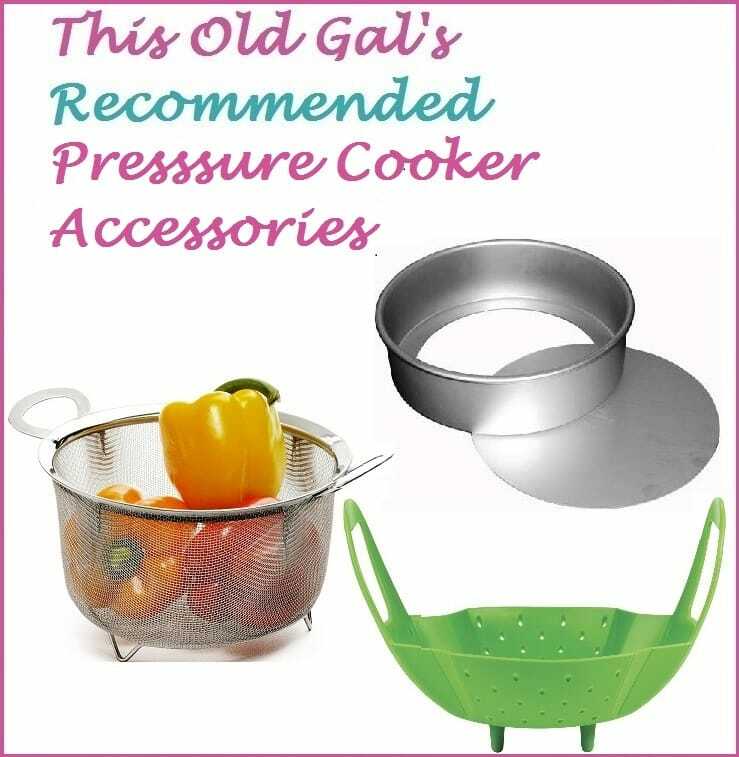 Do you have any idea how I would need to adjust the pressure cooker piece of this to cook those instead of 4 thawed thighs? Can it be done? Thank you! I would suggest 13 minutes for all of that. If the dark meat still isn’t cooked, then you can always keep it in the pot while the sauce thickens or when crisping up in the oven, give it some extra time. Welcome to pressure cooking! Thank you so much for the nice comments. I am glad you liked the chicken and my coconut rice recipe. 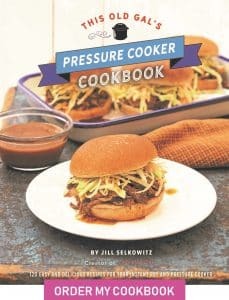 Welcome to the World of cooking under pressure! Instead of apricot jam, do you think fresh apricots would be ok in the pressure cooker? I don’t see why fresh apricots would not work. Perhaps add a bit of a sweetener, like honey or agave, if needed. This looks awesome. I have leg quarters….do you think the cook times would remain the same? is this recipe with the skin on? I have a large family and just bought the instant pot. Could I add more thighs and how would that affect the cooking time? Thanks! Cook time would be the same. Double everything. 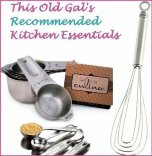 do you suppose that I could use boneless/skinless chicken thighs or even breasts? Not a problem. Cut the time by a few minutes. This sounds yummy, my only question is the amount of water. My instapot says to not use less then 1 cup of liquid but you call for only 1/2 cup of water and a tablespoon of lemon juice. For my own peace of mind can I increase he water to 1 cup. I will also be using 10 to 12 chicken legs would the cook time be the same?